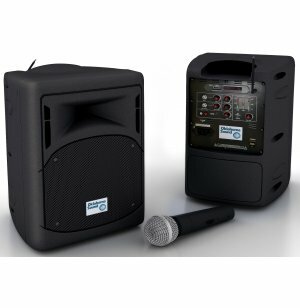 With the Pro Audio Wireless Portable PA System from OSC, you will be heard throughout the room, loud and clear. This powerful system projects a strong sound, which is projected clearly for up to 100 feet away from the speaker. Built-in bluetooth technology allows you to sync and play audio directly from your smartphone, and a USB port plays MP3 files as well. If you want an additional wired microphone, there's a jack for that too! 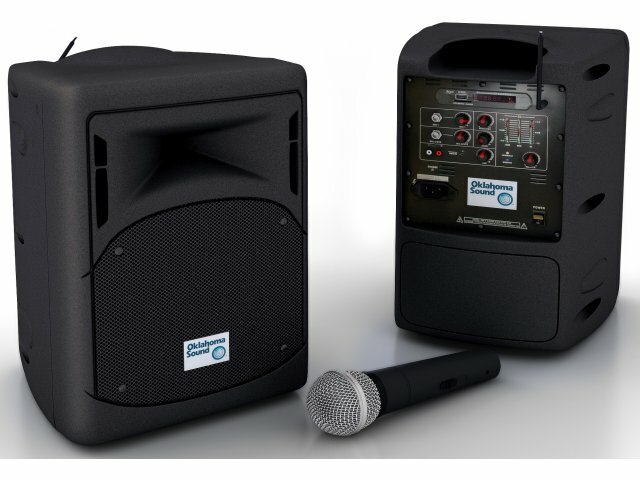 This wireless portable PA system accommodates virtually any kind of input, and all within one convenient, compact package. The speaker weighs just 19 pounds, and includes a built-in carrying handle for easy transport. A rechargeable lead acid battery allows for up to five hours of wireless use. If you want an all-inclusive sound system for a lecture hall or classroom, look no further. Mic Options: Comes with your choice (one) of three wireless microphone styles: handheld mic, tie clip mic, or headset mic. Easy Transport: A built-in carrying handle makes it easy to lift the 19-pound speaker. Great Sound: The 40-watt solid state amplifier feeds into an 8-inch built-in speaker, giving off a clear sound for up to 100 feet away. Flexible Input: Can be synced directly to a smartphone with bluetooth technology, play MP3 files through the USB port, and includes an SD/MMC port. Additional Jacks: Control panel includes ⅛" and ¼" auxiliary inputs for MP3 and other media players as well as a ¼" mic input for an additional wired microphone. Wireless Capability: Can be plugged into an outlet, or run for up to 5 hours on the rechargeable, lead acid battery. Convenient Design: Built to accommodate a tripod setup.